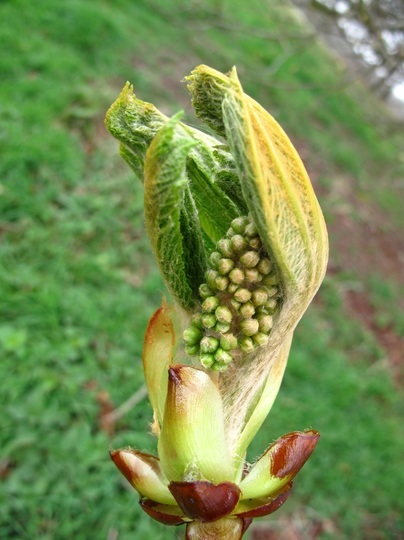 Spotted this horse chestnut bud on Bringsty Common, Herefordshire. Well spotted Stiki ;I love stikibuds , they remind me of infant school when they were in a jam-jar on the window -sill in the classroom ( along with beans in tall jars growing with blotting paper , and tadpoles ) . Not seen any here yet , the weather is too irratic I think . Yesterday was a dream , but today cold and wintery again . we had a lovely afternoon [well i did when i went to herefordshire] on wednesday but the last two days have been grey and cold. most of the tree was in tight bud SL but there were a few of these lower down. and here, i turned the heating on at 2, i had enough of being cold!!! I think you are a few days ahead of me up here Sticki. Love fresh bursting leaves, the Willows are so new and bright right now. If you go and take a close look now (I don't mean right now) they have a little catkin. I have been trying and failing to get a close up of it. oh i missed that! i couldnt go now, its dark and probably an hours journey from here as well as no lights on the common ~ not sure i could find it. will look out for them though. going to Cookham tomorrow then Devon on monday ~ have to see if i can find any. Only 4 days to the equinox! Four days till real spring gattina? It's not a new camera BA, in fact it has a scratch on the lens and I dropped it yesterday! And it's easy to use, I don't do anything complicated with it. I can't remember all those plant names nor do I know so many as you do, camera would be easy peasy for you! Ba you could easily use this camera - you don't have to use all it's functions, I don't - by a long way! You both made me laugh!